When I sat down with Leland, Dog and Beth Chapman to talk about their upcoming new CMT reality series Dog and Beth: On The Hunt and told them that my own family loved watching theirs on A&E’s smash Dog the Bounty Hunter, Beth wanted to know what I liked best about the show. I told her it was her family’s bond. Much to my surprise — and with Dog and Leland looking on — she offered candid insight into what the Twittersphere has been discussing since plans for the show were announced in the summer: the absence of Baby Lyssa and Duane Lee Chapman from the cast of the show. 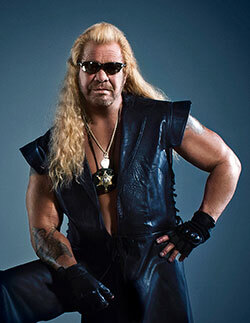 Slated to being in April, Dog and Beth: On The Hunt will focus on the three remaining Chapmans as they crisscross the nation, teaching struggling bail bond agencies how to succeed in the embattled trade by helping them hunt down some of America’s most dangerous criminals. While the show will highlight the Chapmans’ proven methods for capturing criminals and Leland’s expertise in non-lethal weaponry, Dog and Beth: On The Hunt will also address the family’s changing dynamic. 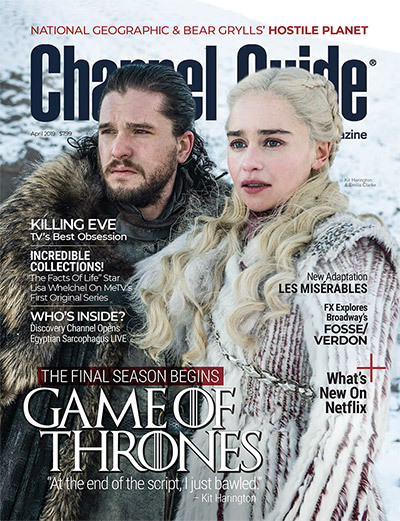 • RELATED: Channel Guide talks with Lyssa Chapman about her new memoir, her parenting insights, her plans for a new TV show and more! • RELATED: Vote Dog & Beth On The Hunt for Best Family Values in Channel Guide’s 2014 Viewers Voice Awards! Does that mean Lyssa and Duane Lee might join the show at a later date? The Chapmans didn’t say. But in the meantime, you can rest assured that Beth and Dog can relate to the pain and frustration fans felt as the Chapman children entered and exited Dog The Bounty Hunter throughout its eight seasons. “We were lucky because our kids didn’t go away to college — our kids went to the college of hard knocks with us,” she says. “And so when there was some turmoil in the family, it was like our kids went to college all at the exact same time. We had that separation anxiety from them. But it really wasn’t that. It was just that they were spreading their wings and getting older. And they had their own families. These guys are a joke they claim to care but they call the fugitives all types of nasty names they claim to be god fearing and they talk to these people who are already in a bad place and treat them like pieces of crap then are all nice for the cameras I guarantee they wouldn’t talk to folks I grew up with like that they always catching folks in the islands or country they wouldn’t have a chance in the city like NY or ATL. To my favorite family! I live in Taylorsville, UT. and have a son who has been on heroin for over 10 years. He got hurt snowboarding and a man said hey dude take some of this and you will be cured you won’t feel any pain. Needless to say that was his start of his drugs. I am a single mom and have 4 kids and 3 grandkids and I will not give up on my family. I have 3 boys and 1 daughter. I was so lucky to be blessed to have theses children brought into my life. I lost 3 pregnancies. I was married to a police officer for 14 years and passed away on Mother’s Day 2014. I lost my father this year in April 11, 2014 had his funeral April 14,2014. I was my daddy’s little girl and favorite unfortunate he loved my kids and we all were there for my parents. Besides the point I have always tried to work 5 jobs and be able to take care of my kids and grandkids in time of need. I would like to talk to one of you about a circumstance about one of my other children who needs help and keeps saying its the end. Please call me, I have a sewing business and make – up business, babysit, Nail-Tech. I also have my Bail Bonds Recovery Agent badge. I love each and everyone of you. Thank You for loving all of us. Tell Duane Lee, and Leland HI for me Love to ALL! I love watching Dog n Beth’s older episodes, I set my alarm every morning for 6:30 am, I live in New Mexico, n I won’t miss an episode. Beth, your such a good role model for all woman n I’m looking forward to watching the new show,Blessings to all the Chapman family..
wish u guys could come back on tv!i watch dog every morning-wont miss not 1 day,&would love 2 talk 2 beth!! I will miss Duane Lee but you are right, your kids grow up and they need to do what makes them happy. I wish all of you the best of luck in your life endeavors. Be safe. I am an addict. I have been clean for 6 weeks. I have never been in trouble with the law, I just chose to clean my act up. I love Beth. She is real, a mother to mother, an awesome woman. God has truly blessed her with such love and caring each and every human being. May God bless you more and more everyday. I really hope your recovery is going well.